Each of your meals should provide a combination of carbs from whole grains, vegetables or fruits; proteins such as lean meats, peanut butter, or dairy; and healthy fats from foods like olive oil, nuts, or salmon. Your mom was right when she said that breakfast is the most important meal of the day. A proper morning nosh awakens your metabolism; improves your focus, memory, and mood; and boosts your energy levels all day long. 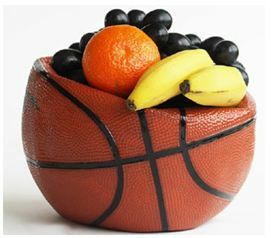 Though you probably grew up on a three-meals-a-day diet, recent research indicates that athletes perform better by eating five or even six smaller, more frequent meals throughout the day. Try to consume an equal number of calories in each meal or snack, and space your eating sessions about three to four hours apart. Your car doesn’t run without fuel, and the same is true of your body. Training on an empty stomach — whether in a workout, practice, or a game — is like trying to drive with the tank on “E”… you’re bound to stall. A pre-workout meal provides your body with a readily available source of energy. For best results, consume a lean protein and slow-burning carbs like brown rice, sweet potatoes, or oatmeal about an hour or so before training begins. You want to drink enough water to replace what you lose through sweat, but remember that hydration is an ongoing process. Make sure your fluid intake is adequate at all times — before, during, and after activity. Exercise depletes your body of energy and can damage muscle tissue, so it’s important to replenish your glycogen stores (the body’s main source of fuel) and supply some protein for muscle repair within about an hour of working out. Studies indicate that taking in a 3:1 ratio of carbs to protein can help you accomplish both goals. Aim for 15 to 30 grams of protein and 30 to 90 grams of carbs after your workout.